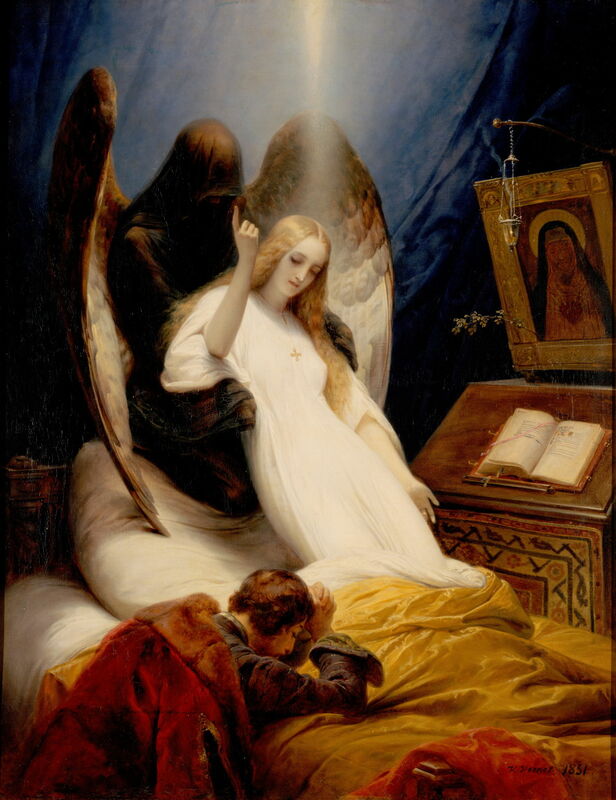 Horace Vernet (1789–1863), The Angel of Death (1851), oil on canvas, 146 x 113 cm, The Hermitage Museum, St. Petersburg, Russia. Wikimedia Commons. 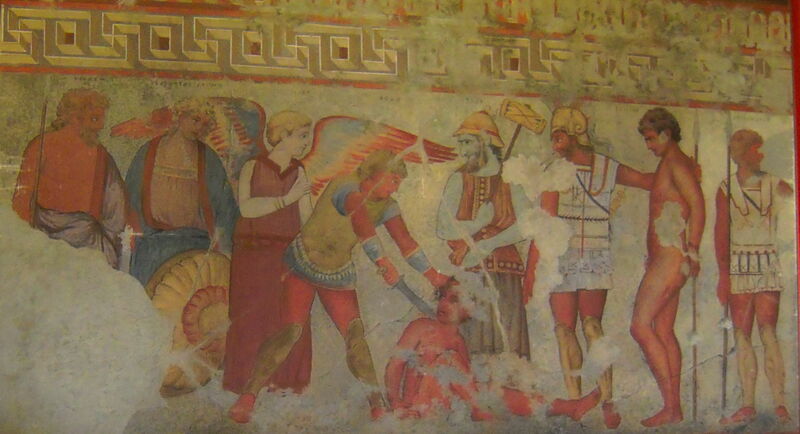 I identified two of the figures in the striking and gruesome painting on the wall of an Etruscan tomb at Vulci as being Etruscan gods: Vanth and Charun. Unless you are already familiar with Etruscan myths, these should have come as a surprise, particularly because of Vanth’s resemblance to the winged Christian angels which were to start appearing around seven hundred years later. Vanth and Charun have been identified as the deities associated with death. They are often seen as a couple, accompanying those who have just died, or are about to die. 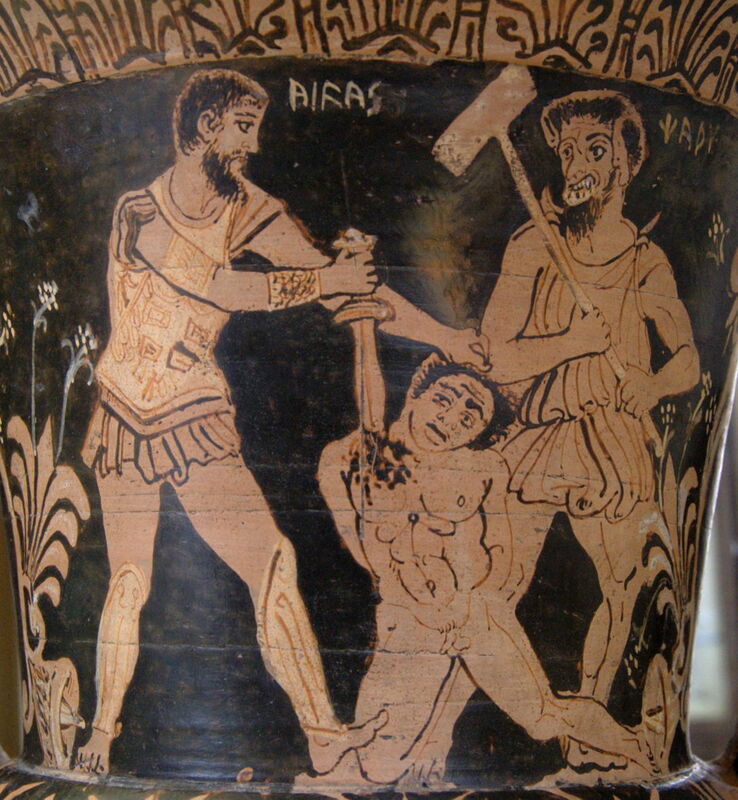 They certainly had their work cut out as Achilles carved his way through the necks of Trojan captives. Unknown, The Farewell of Admetus and Alcestis (c 325 BCE), Etruscan red-figure volute krater found in Vulci, drawing of the original by George Dennis (1848). Original height 62 cm, now in Cabinet des Médailles, Bibliothèque nationale de France in Paris. Wikimedia Commons. The Farewell of Admetus and Alcestis (c 325 BCE) is an Etruscan vase painting of the Greek myth of Admetos, the King of Pherae, and his wife Alcestis, described in several sources, including Euripides’ play Alcestis. When Admetos’ fated day of death came, Apollo intervened to help him – according to Aeschylus, by making the Fates drunk, so that they agreed to reprieve him from death if he could find a substitute. His wife Alcestis substituted for him. In this painting, Alcestis is shown making her farewells to her husband, as two versions of Charun (Etruscan, not Greek!) await their victim. Charun on the left wields his trademark hammer, while Charun on the right holds his characteristic snakes, but seems to have borrowed Vanth’s wings. In Euripides’ version, as Alcestis is being taken to the underworld, Admetos decides that he does not wish to live. Heracles intervenes and Alcestis’ life is saved. 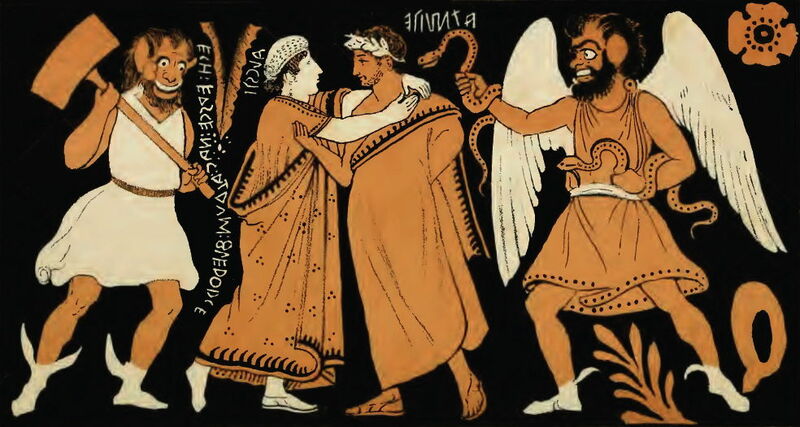 Being a Greek, Euripides has Alcestis being taken down by Thanatos, the Greek (and male) version of the Etruscan Vanth, complete with wings. Unknown, Wall painting in the Tomb of the Charuns (or Demons), further details not known. Wikimedia Commons. 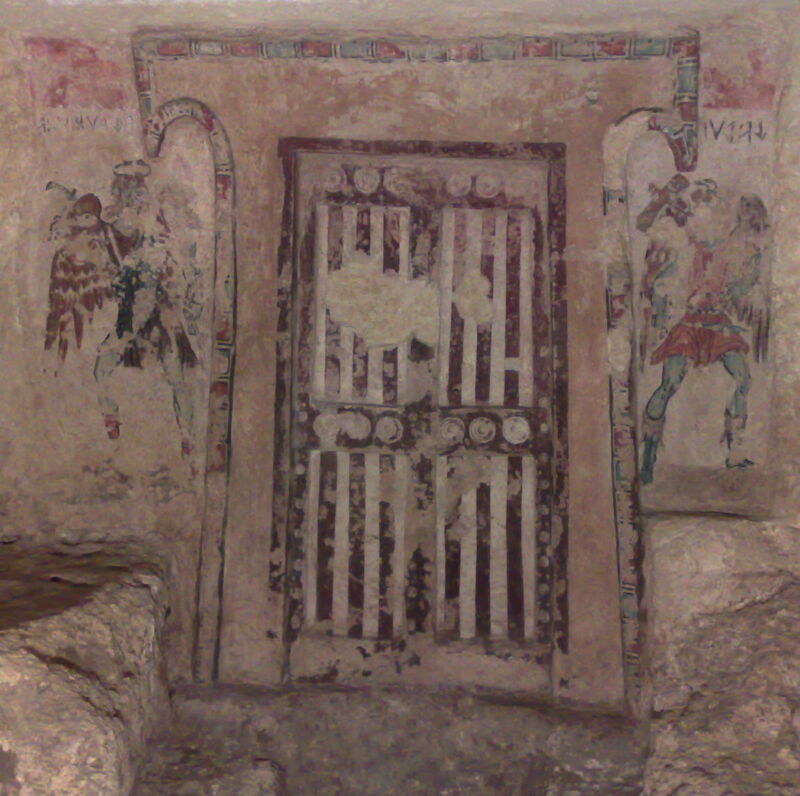 This wall painting from the Tomb of the Charuns (or Demons) shows a typical appearance of Vanth (left) and Charun (right), either side of a door in an Etruscan tomb, although here the door itself is painted rather than an opening. It is also interesting to note that Vanth appears to have a halo above her head, although given the condition of this painting it is far from certain (and unusual too). 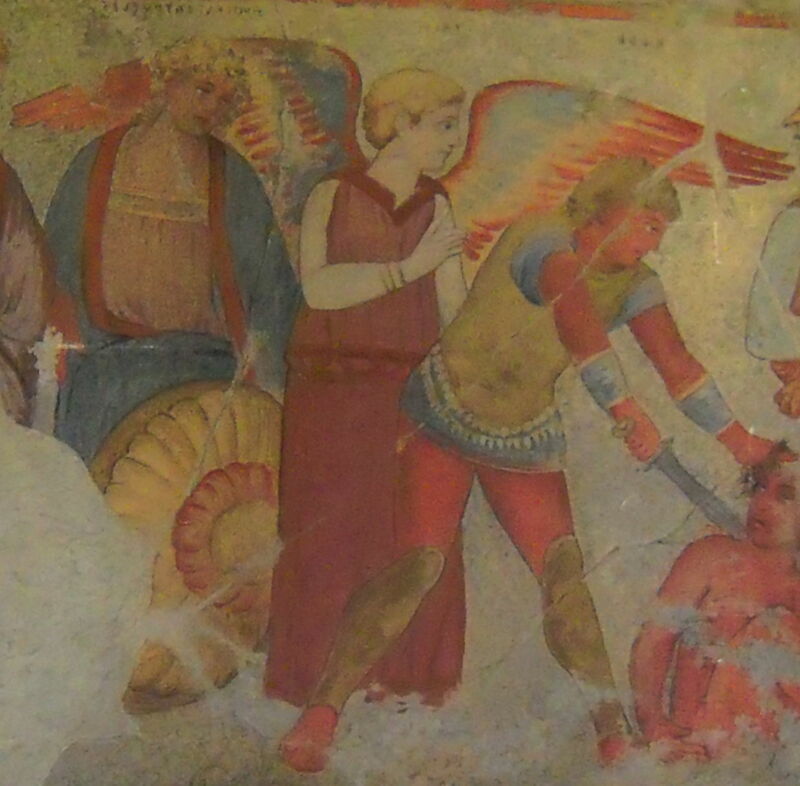 Unknown, Fresco in the François Tomb (detail) (copy by Augusto Guido Gatti in 1931 of original from c 340 BCE), Vulci, moved to Villa Torlonia già Albani, Rome. By Battlelight, via Wikimedia Commons. Going back to the original scene of Achilles killing Trojans, the version of Charun shown there is fairly typical, but not stereotypical, in that he does not have snakes with him there. His distinctive hammer or mallet is used to open the bolt on doors, particularly that to the underworld, it would appear. Unknown, Etruscan Krater from François Tomb, depicting Achilles sacrificing a Trojan Captive (c 340 BCE), red figure calyx krater, found in François Tomb, Vulci, now in Cabinet des Médailles, Bibliothèque nationale de France in Paris. Wikimedia Commons. This painted krater was also found in the François Tomb, and shows Charun alone, without a partner Vanth. Of the two deities shown in the painting of Achilles killing Trojans, it is Vanth who merits the rest of this article, which promises to explain why angels have wings. 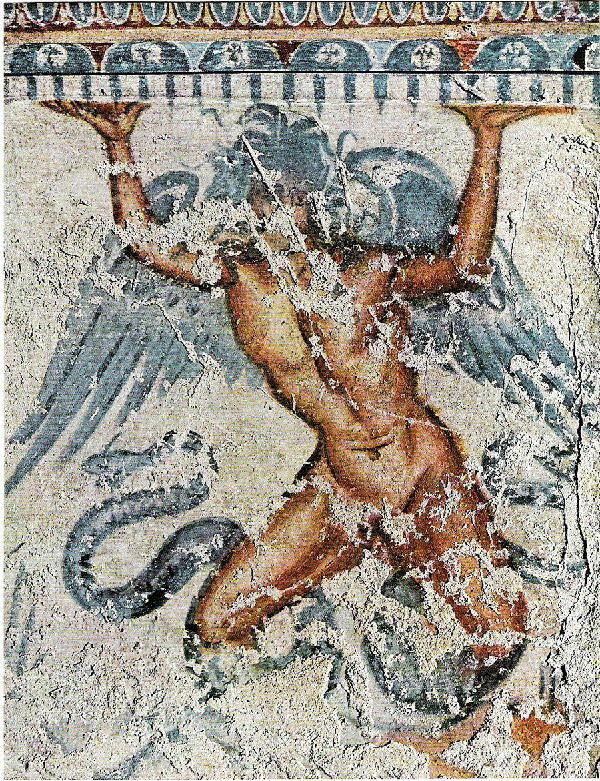 Unknown, Typhon, wall painting from the Tomb of Typhon (c 150 BCE), Tarquinia, moved to Museo Nazionale, Vitteleschi Palace, Tarquinia, Italy. Wikimedia Commons. Vanth is by no means the only Etruscan deity to come with wings attached, although she is probably the most consistently winged. In this wall painting of Typhon, from much later, around 150 BCE when the Etruscans had been assimilated into the Roman Empire, the Greek monster Typhon has acquired wings in his Etruscan form. Unknown, Ishtar Vase (c 2000-1600 BCE), terracotta with incised and painted decoration, 26.2 cm high, 13 cm diameter, Musée du Louvre, Paris. © Marie-Lan Nguyen / Wikimedia Commons, via Wikimedia Commons. 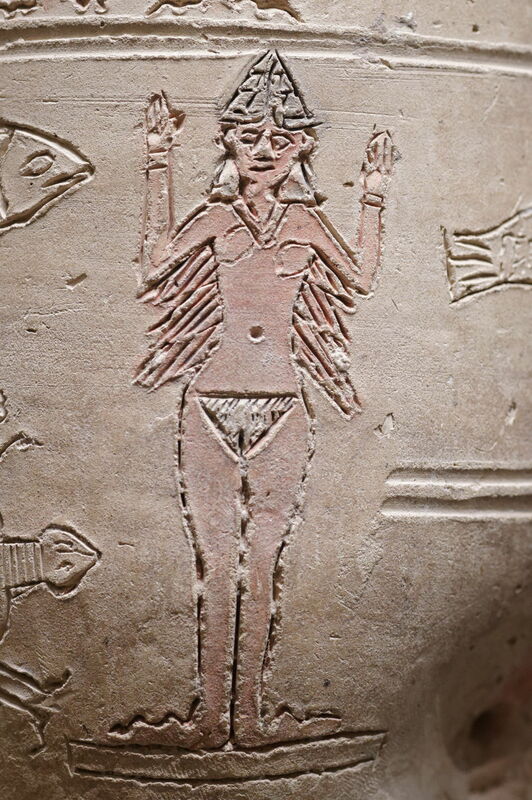 Winged female deities go back much further than even the Greeks, with the likes of the Mesopotamian Ishtar, shown here incised into the terracotta of the Ishtar Vase which may date to as early as 2000 BCE. Unknown, ‘The Burney Relief’ (Old Babylonian, c 1800 BCE), clay, 49.5 x 37 x 4.8 cm, The British Museum, London. By Aiwok, via Wikimedia Commons. 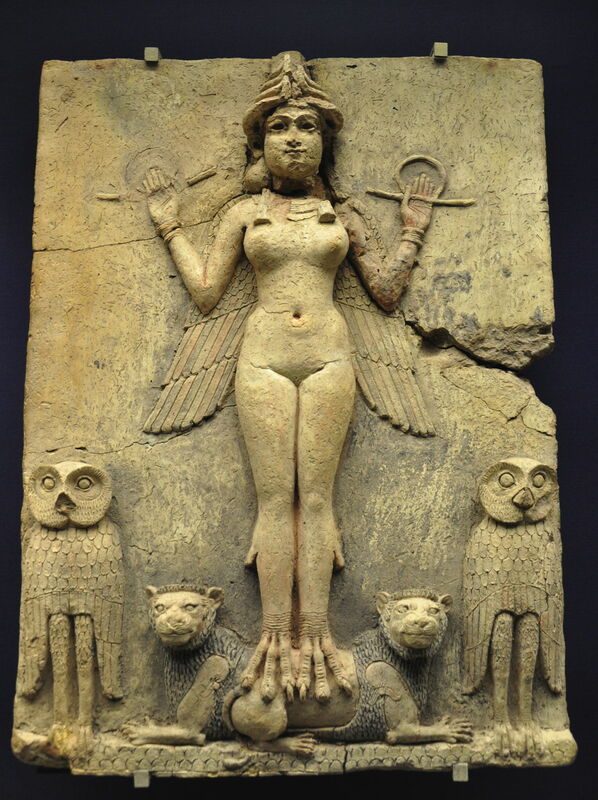 More detailed and sophisticated, the famous Burney Relief shows Ishtar too, and has been more confidently dated to Old Babylonian times, around 1800 BCE. If you know your Greek deities, you will also recall that the goddess of victory, Nike, and the gods Eros (love and life) and Thanatos (death, similar to Vanth) were usually shown as human bodies with angelic wings. So it would seem an easy step to suggest that the early Christians simply borrowed this ‘pagan’ symbolism when they developed the first depictions of Christian angels. Nowhere in the Old or New Testaments (nor in any of the apocryphal writings, I think) are the angels of the Israelites or of Christians described as being winged. Cherubim (‘cherubs’) and seraphim were, but not angels. 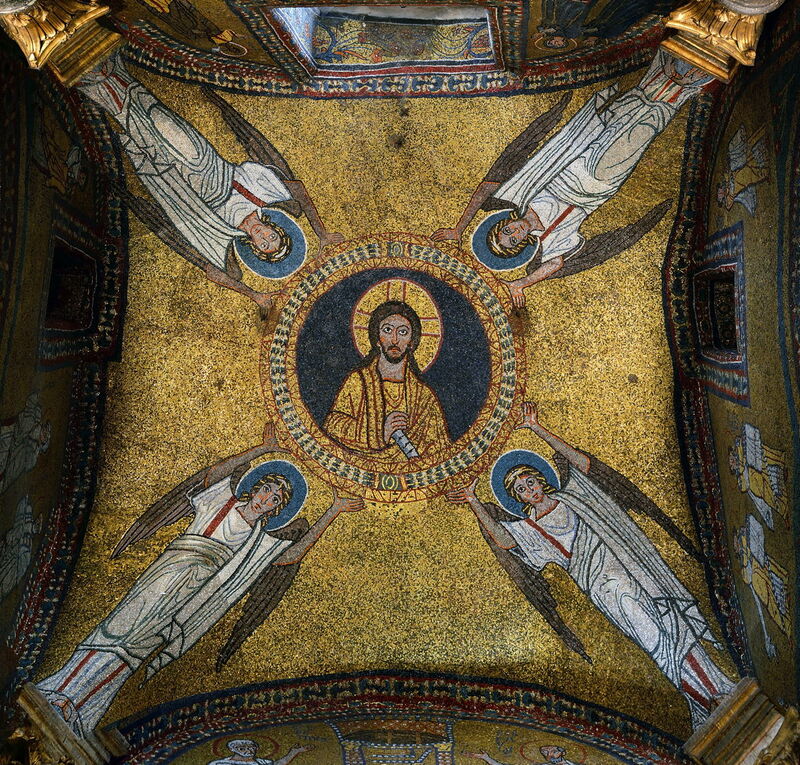 The few depictions of angels in the Christian tradition to around 390 CE omitted wings too (I have been unable to locate a suitable image to illustrate this, I am afraid). Then, between about 390 and 400, they suddenly acquired wings, and by 600 CE wings were universal and mandatory. Unknown, Mosaic of the vault of the chapel of San Zeno (817-824 CE), Santa Prassede, Rome. By Livioandronico2013, via Wikimedia Commons. This breathtaking mosaic in the vault of the chapel of San Zeno, in Santa Prassede, Rome, from 817-824 CE, shows them very clearly, as does every painting of the Annunciation. The few Moslem miniatures which show angels followed suit. 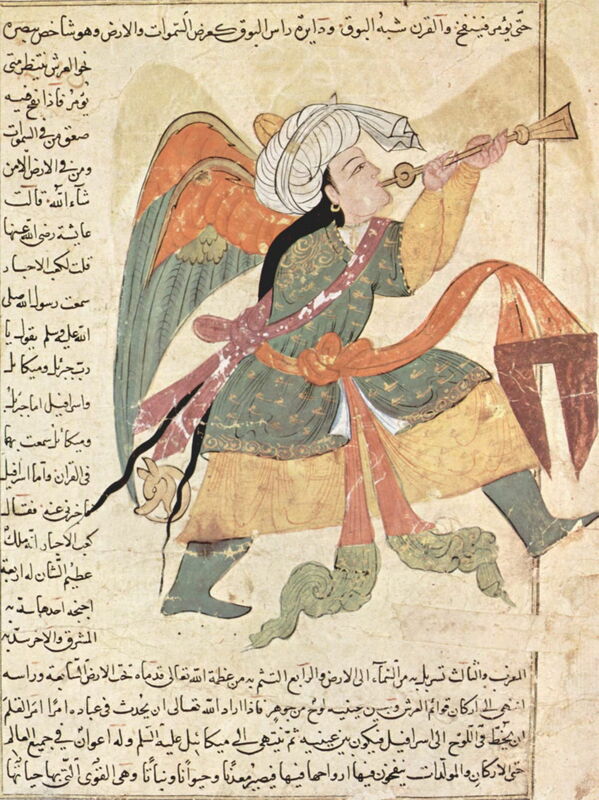 This painting of The Archangel Israfil by Zakariya al-Qazwini from 1280 is even more cross-faith, as a Moslem depiction of an Old Testament (Israelite Jewish) angel following this Christian tradition. 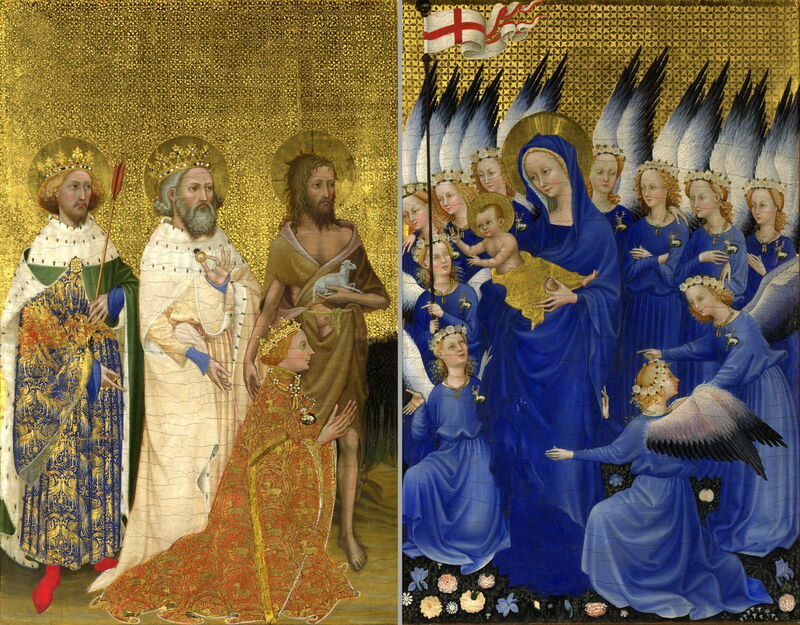 The wings of angels were often key elements in paintings, as in the sublime Wilton Diptych (c 1395-9), where they impose a clear rhythm. Hieronymus Bosch (circa 1450–1516), Ascent of the Blessed, panel from Visions of the Hereafter (c 1505-15), oil on oak panel, 88.8 x 39.9 cm, Museo di Palazzo Grimani, Venice. Wikimedia Commons. Another highly original and beautiful depiction of winged angels is in Hieronymus Bosch’s panel Ascent of the Blessed, one of the four panels making up his Visions of the Hereafter (c 1505-15). These wings enable clear distinction between humans, and other human-like creatures, and the messengers of God. Being messengers, just as Eros, Thanatos, and Vanth before them, there is a feasible rationale for them requiring their wings in order to move swiftly from heaven (or the pre-Christian underworld) to earth, and in their duties on earth. There is also a deeper and perhaps archetypal role in the ‘angel of death’ – Greek (Thanatos), Etruscan (Vanth), and Christian. Marianne Stokes (1855–1927), Death and the Maiden (1908), oil on canvas, 95 x 135 cm, Musée d’Orsay, Paris. Wikimedia Commons. 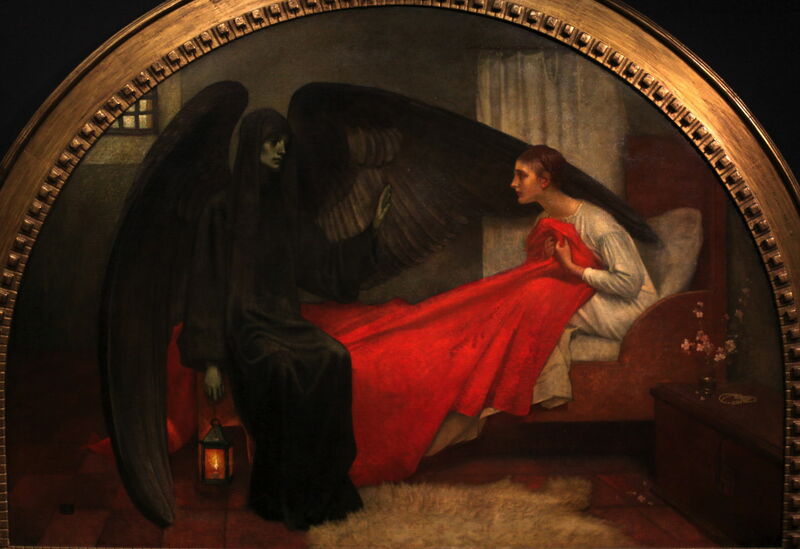 Depictions such as Horace Vernet’s The Angel of Death (1851) and Marianne Stokes’ Death and the Maiden (1908) were only too familiar to many Christian families across Europe during the nineteenth and twentieth centuries, just as they must have been to the Etruscans, Greeks, and Trojans long before. Wikipedia listing of Etruscan deities. de Grummond NT (2006) Etruscan Myth, Sacred History, and Legend, University of Pennsylvania Museum. ISBN 978 1 931707 86 3. Posted in General, Painting and tagged angel, Bosch, Charun, death, Etruscan, Greek, Ishtar, Mesopotamia, narrative, painting, Vanth. Bookmark the permalink.